The Strangers # 7: Prototype! This issue picks up from Break-Thru # 1 and Prototype # 5 so we start in the middle of the action — The Strangers, we are told, have stolen J.D. Hunt’s rocket to get to the moon in hopes of investigating the strange energies that are found there. Now, I thought about doing mini-reviews of those other issues but I chose not to because both series will be covered elsewhere and I think we all need to be reminded sometimes of what it’s like to follow only one or two series — and then have said series hijacked by a crossover. It’s been about 20 years since I’ve read Break-Thru and much of my memory is cloudy… so reading this issue of Strangers is very much like being a reader who chose not to follow the rest of the crossover. We also learn that Dave’s indigo power allows them to survive in space. Yes, it turns out that whatever force gave The Strangers their powers knew they’d eventually need to leave Earth and journey into the stars. Meanwhile, Yrial and Electrocute battle Prototype out in space and we’re reminded once more that our android heroine is one of the most powerful members of the team. Her actions lead to Prototype realizing that fighting is getting him nowhere so he surrenders and offers to work with The Strangers. A wise decision. After battling some carnivorous aliens, Empire is killed and Electrocute is reminded once more of how little she understands about the human experience… seeing death so close and personal greatly upsets her and leads to her begging Grenade for comfort. If it sounds like I focus a lot on Electrocute in these reviews it’s because Englehart’s characterization really shines in her scenes. She’s the classic “tin man” who yearns to be human and while it’s a classic trope, it’s always effective when done well. There’s an emotional sacrifice on the part of Supra that allows our heroes to escape with the rocket and continue their trek to the moon — kind of a shame to see both of the new characters we’re introduce to here killed off but they’re more interesting in death than they were beforehand. We then get an absolutely hilarious two-page strip featuring Englehart and Hoberg explaining The Strangers and their origins to some young fans, who continually point out all the other heroes that are similar or that these creators have worked on previously. I loved this. Really, really worth seeking out. Story-wise, this is a fun issue with solid characterization. Even if you aren’t reading the rest of Break-Thru, it made sense and progressed not just the crossover’s plot but the ongoing Strangers subplots. Great art from Hoberg — as always, his facial expressions are solid and he draws a fantastic Prototype! 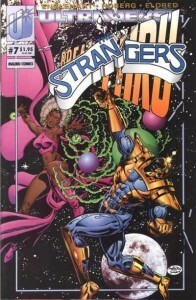 Next issue: The End of a Stranger?! Can it be? Stay tuned….